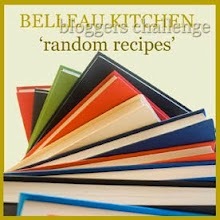 For this month's Random Recipes, Dom at Belleau Kitchen challenged us to choose a recipe at random from one of the recipe books we received for Christmas. Christmas seems so long ago now! I was given two cookery books as gifts - The Great British Bake Off's Showstoppers, and Celebration Cupcakes, by Tamara Jane. There are some great recipes in both that I'm looking forward to making. For the purposes of this challenge I chose the GBBO book and wondered what elaborate, decadent cake the page might open upon...but it wasn't cake at all, it was bread. Not only that, but it was one of Paul Hollywood's technical challenges from the series! I remembered watching the contestants making it and tying themselves in knots, quite literally. Still, I was willing to give it a go, and I was quite pleased with the way it turned out (though I fear that Paul himself may not have been blown away). If you think the picture looks rather different to the long plaited loaf the contestants made in the series, you'd be right. I don't know if I rolled out my strands of dough too much before I began knotting, but I ended up with a plaited rectangle that was far too long to fit in my oven in a straight line! Instead I decided to curl it round and overlap the ends to make a knotted wreath. It cooked perfectly well like this so it might be an option if you can't fit the loaf as it is meant to be in your oven! 1 beaten egg, to glaze - though I forgot to use this in my recipe! Put the flour, salt and yeast into a large mixing bowl - at this stage make sure the salt and yeast don't touch, as apparently salt can kill the yeast. Add the oil and mix - I did this by hand. Gradually add the water and bring the mixture together. Knead on a lightly floured surface until the dough is stretchy. Place the dough in a lightly oiled bowl, cover with clingfilm and leave at room temperature for an hour to rise. Divide into eight equal pieces - I found this easiest to do with a pizza cutter. Roll each piece out into a long sausage shape of the same length. Overlap the pieces at one end and press down a little to anchor them. As I got towards the end I found some of my strands were longer than others so I couldn't plait them exactly according to the pattern and so the end does look a bit messy. Paul wouldn't be pleased! Leave at room temperature for an hour to rise. Preheat oven to 200C. As I mentioned at the beginning, the loaf was too long for my oven so I joined the ends to make a wreath. Bake for 20-25 minutes in the oven until browned. Here's the finished loaf. I made it the day before I wanted to eat it for lunch as I was going out in the morning and knew I wouldn't have time for this whole process when I got back. The bread was nicely cooked on the inside and sliced well. I served the bread along with a platter of hams and cheeses for a low-key weekend lunch. It was delicious and I was very proud of making the bread myself, as I usually use my bread making machine! I'm sending this to Dom at Belleau Kitchen for his Random Recipes challenge. That looks like a good loaf. I think I would get very befuddled with all those strands!